Nick Kingstone, a 29 year old data analyst from New York shares about the fun they have with his 24 year old girlfriend, Natasha Atkins. The most important thing in a relationship is the ability to have fun and basically enjoy the time together. Nick and Natasha shared a number of quizzes, which they asked each other. Couple quizzes also help to build the relationship stronger and making the couple know and understand each other well. When asking the questions, you should ensure that you do not argue about the answers. In addition, everyone is entitled to their opinion. When you are just the two of you and you know you are ready for the question, here are some of the quizzes that Nick and Natasha asked. • What if you were asked to swap tablet for a cheap phone? Nick said that they would have to flash his memory in order to get the iPad from him. He concluded by saying that it is among the last things he would do. • What if you were told to submit your laptop for a month? My laptop?, asked Nick, never. So Natasha wondered why Nick would not want to submit his laptop for juts a month, probably because of the part-time job. • What if you abruptly earned five times more than your current salary? I’d first take you to Hawaii for a week long vacation, Nick answered. That made Natasha faltered and almost forgot the next question. • What if you became the next president? You’d be the first youngest first lady, he answered with a smile on his face. • Which celebrity couple do you admire and why? Denzel and Pauletta Washington, because they have been married for 30 years, said Natasha. Clearly, Natasha values marriage and dreams of a longer one. • Which sports woman do you wish to meet and why? Serena Williams, in order to ask how he manages to maintain the leads over all those years. • If you were to play a role in a film, which film would that be? Beauty and the Beast, Natasha answered and laughed at Nick’s surprise. She then calls it a joke and confirms that it would be Safe Haven. 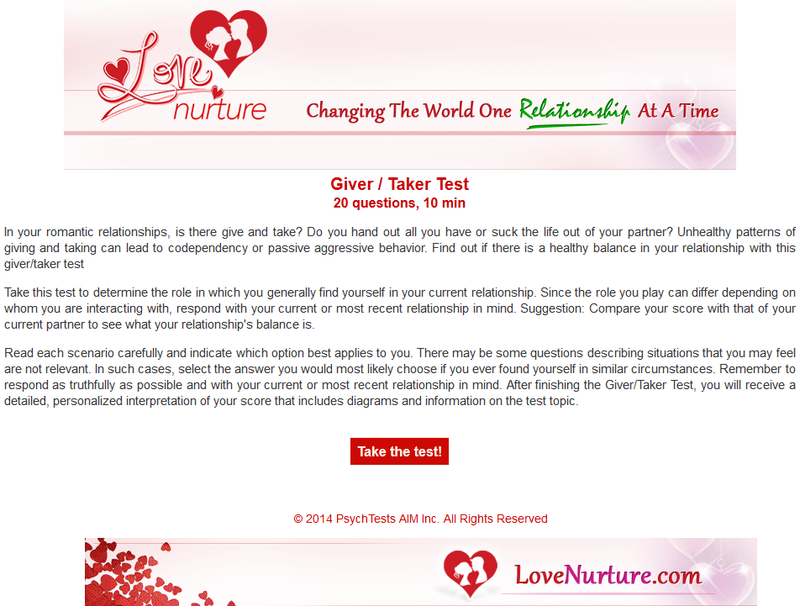 Have You Tried The Giver/Taker Test? • What is the most mortifying thing that happened to you today? I walked in the office with my fly open and the secretary was the first to tell me, Nick answered. • What is the most embarrassing event you have ever observed? A lady was making a call, when her dress was caught in a car when the door was closed. The car started moving, and things fell apart. • What is the most mortifying thing your parents ever told you? My mum said our cat is braver than I and dad said my grandmother, his mom can do better than I in math. • What was your happiest flash at work? Natasha answered that it was when her boss handed her the $1K raise check. • What was the happiest event in your life? When my dad took me to Disney World, simply unforgettable. • Who has ever made you happy that you can never forget in your life? You! Natasha answered, When you stood in front of the classroom and stopped everyone from making fun of my glasses. • If you had all the money and time, what kind of trip would you wish to have? A romantic one, filled with lots and lots of video games, Nick answered. Well, it’s not a surprise, a man and video games are somewhat inseparable. • Would you take me or your best gaming buddy to the trip? Choose One. Nick thought about it and said Natasha, but he asked if Josh, the gaming buddy can follow them afterwards. • If there were weird stuff that the locals eat at the place, would you eat with them? I’ll pack my own food, he answered. Nick and Natasha are one great couple that connects, and are free to each other. There is always fun in couple quizzes and mostly if everyone asks a different set of questions. Normally, asking the same questions might not produce an honest answer, especially if one answers after the other. You can find more information on the top quizzes for couples here.